6sqft’s series The Urban Lens invites photographers to share work exploring a theme or a place within New York City. 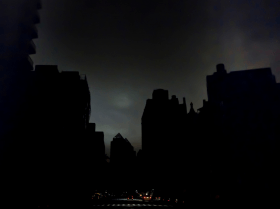 In this installment, Orestes Gonzalez shares his series “Dark Sandy,” photos he took five years ago when lower Manhattan lost power during Hurricane Sandy. Are you a photographer who’d like to see your work featured on The Urban Lens? Get in touch with us at [email protected]. “Never had I seen Manhattan in such darkness… I had to get over there and experience this dark phenomenon with my camera,” says Orestes Gonzalez of his series of photographs taken the night Hurricane Sandy hit New York City. As we now approach the fifth anniversary of the Superstorm, the photos are a reminder of how far we’ve come, and in some cases, how much work still needs to be done. In fact, 20% of the 12,713 families who enrolled in the city’s Build it Back program are still waiting for construction to wrap up or for a property buyout. But despite some of the post-storm issues, in the wake of the disaster, Orestes remembers the “sense of camaraderie” he experienced during those dark times, a trait that New Yorkers have come to be known for.